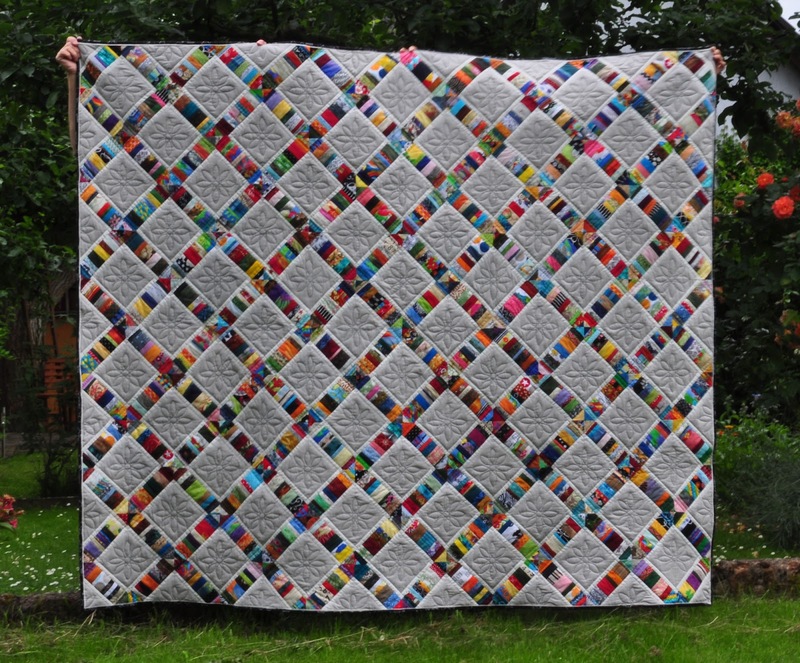 The trellis scrappy quilt is done! 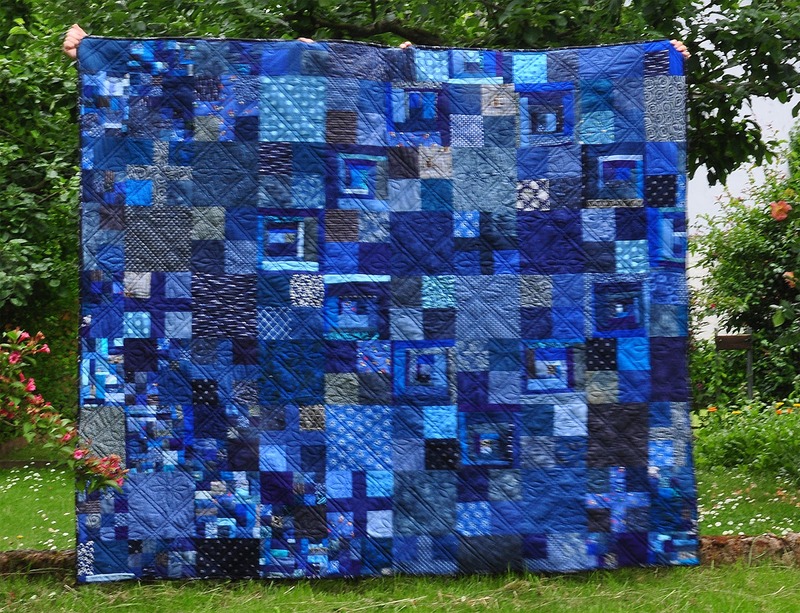 As mentioned before, the quilt is big: 180 x 210cm is the final size. It took two of us standing on a small ledge and raising our arms high to show it in all its glory. 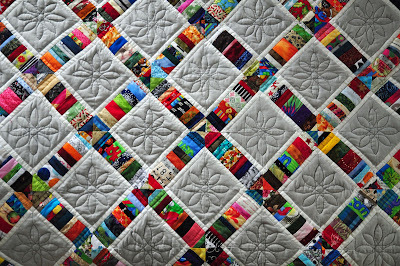 The quilt is for most parts made from scraps (they are still scraps if you buy them in a scrap bag, right?). The grey fabric is from a layer cake I bought half off some time ago; only the white fabric is yardage I bought specifically for the quilt. Both are Kona Cotton, the white is 'Snow' and the grey is 'Ash'. The back is also very scrappy, and completely from my stash. It's not very noticable, but I did an off-center 'Trip Around The World' layout with log cabin blocks, cross blocks, four patch blocks, 25 patch blocks, pure, wild scrappy blocks and nine-patch-in-a-four-patch blocks. For batting I got some cotton batting, which quilted up great. Nice and lofty. The main quilting is in-the-ditch left and right of the white stripes (which involved quite a bit of fabric wrestling), with added flowers in each grey square (I made a stencil and marked each one with a Frixion pen before FMQing). There were quite a few ends to hide, but totally worth it. Finally the binding is a black print (Science Fair by Robert Kaufmann) with a white piping. 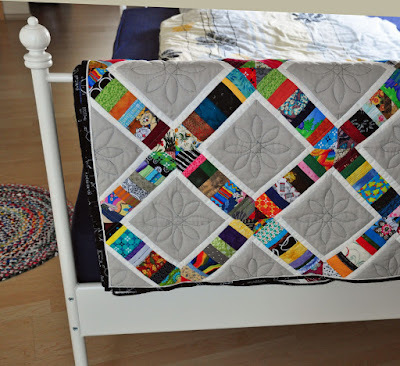 The quilt is desitined for my bed. It's the perfect size. I really, really like how this came out. 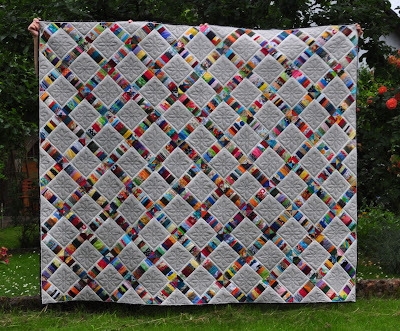 I love that it's scrappy, I love that I used stash scraps for the back, I love the batting. The quilting turned out just perfect. The binding works great.